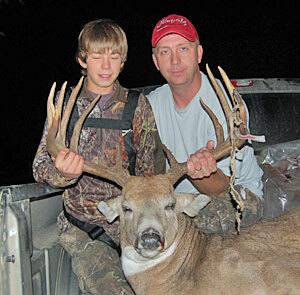 Kevin Hassler and his son James knew this buck was in the area they hunted near Kipling, Saskatchewan. They had been chasing the trophy whitetail with little success, constantly changing stand and blind locations when finally the big buck came into bow range. Young James made a great shot with his Martin bow and the pair watched the brute crash not 35 yards from where they were positioned. "It was James' first buck with a bow, he was and still is very excited with his successful hunt. We have relived the hunt many times over and always look forward to our next adventure!" shares Kevin. The 12-point buck gross scored 185 and netted 174 inches typical.